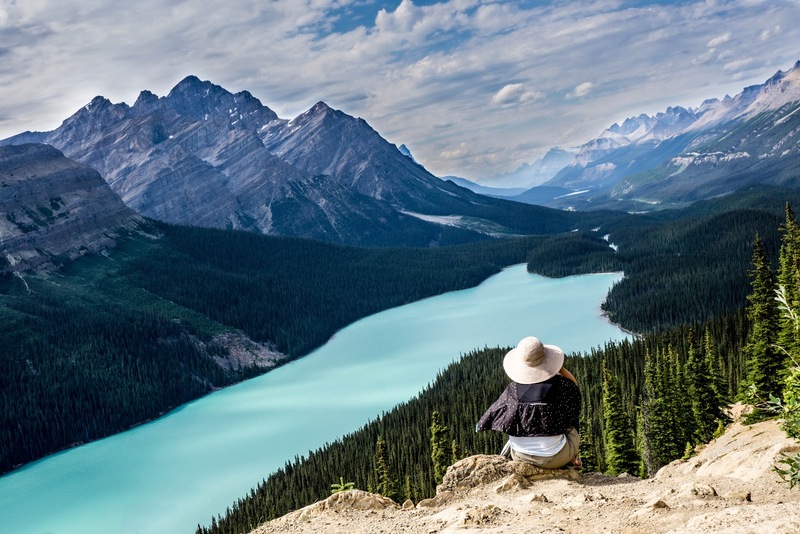 Day eleven of our epic Great Canadian Road Trip has brought us to the amazing picturesque province of Alberta; east of the Rockies and west of the rest. Since we've come from the rest, it was time to check out the Rockies. We got a late start today, but around noon we pointed the Geovan of Destiny westward. Tonight we would sleep in the cool mountain air (as filtered by the crappy air conditioning of an Econolodge). We started in Red Deer, so the pathway to the mountains was thru a town with the awesome name of Rocky Mountain House. Today was going to be mostly a driving day, but we didn't mind so much because: Rockies. Pretty soon we had the towering rocky formations in our windshield. 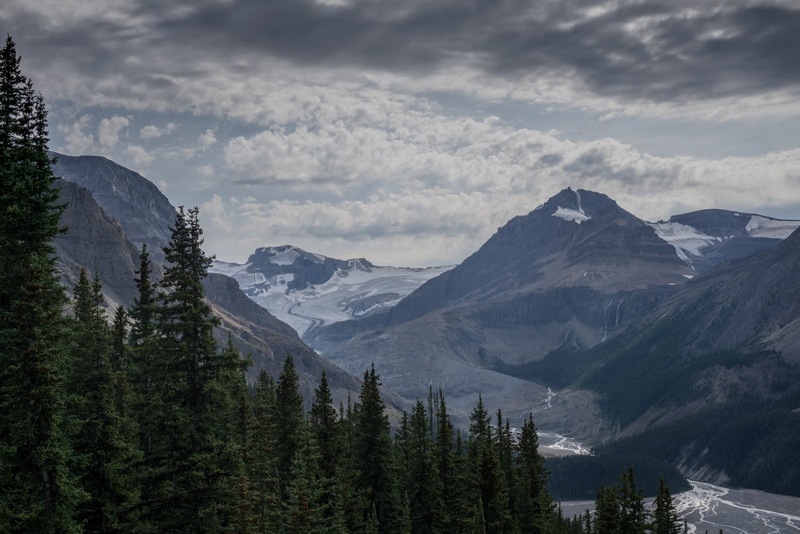 We soon arrived at one of the most awesome roads I have ever driven on: the Ice Field Highway. 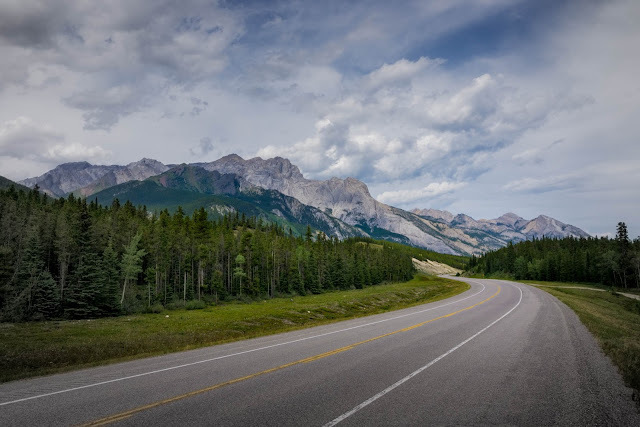 It runs from Jasper to Banff, and reminded me a great deal of the Blue Ridge Parkway (except instead of pine tree covered Appalachians, there was glacier covered Rockies). 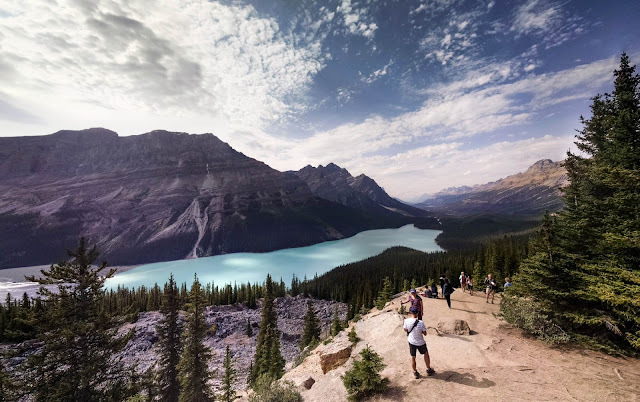 As mentioned it was a day of mostly driving, but we did have time to stop for an earth cache at Peyto Lake, a glacier fed lake in Banff National Park. The fates of time put us in the area during a holiday long weekend, so the crowds were crazy. It was impossible to get a picture without people in it, so when this lady sat in front of my camera, I decided to make her the foreground interest. It also shows off something cool about this lake. Notice the colour? It is a brilliant turquoise. That is not a camera thing - it really is that colour in real life. Several of the lakes I saw had the same amazing colour. Thanks to that earth cache I did, I know why. As the glacier melts and the water flows down the mountains to the lake, the water erodes the rock. When it mixes with river and lake water, it forms a fine suspended dust called rock flour. That rock flour causes the water to refract light as turquoise. Oh, and those glaciers that are feeding the lake? They are easily visible on the south side of the lake. After this we drove a few more hours to Golden, BC. 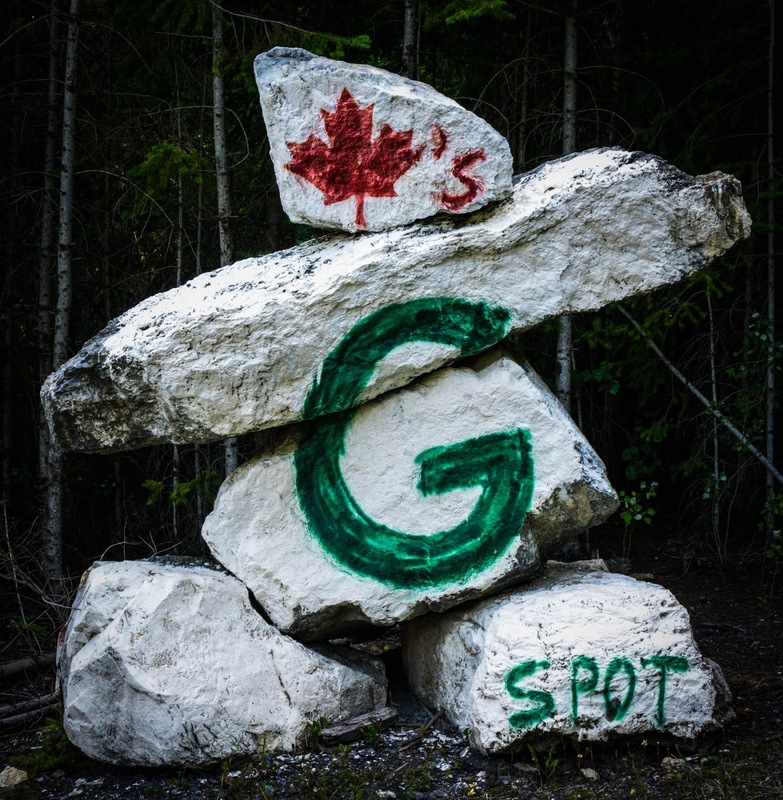 Along the way I found my first British Columbian cache, and a cool inuksuk. We were not planning on spending long in BC. In fact we were heading back to Alberta first thing the next morning. However it did set us up to be in position to explore some more amazing scenery, and some crackin' good railway engineering.